Have you ever spent a few minutes wandering around your house looking for your cell phone only to find the device in your hand? Perhaps you found yourself looking for your sunglasses that were sitting atop your head the whole time. Or maybe you misplaced your keys. These occurrences happen to most of us regardless of our age. But as we age, it’s natural to think common lapses in memory are the start of something more sinister, like Alzheimer’s disease. 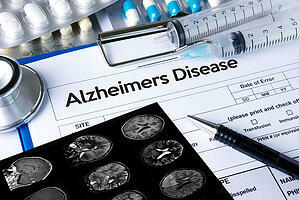 Alzheimer’s is a disease of the brain that can cause a slow decline of memory, reasoning and thinking skills. Like many diseases, it comes with early warning signs. Thankfully, common memory issues — like forgetting where your glasses or keys are — are not a sign of Alzheimer’s or dementia, however these five signs are indicative of a problem. For memory loss to be indicative of Alzheimer’s disease, it has to make an impact on your daily living. That means you or family member have to rely on memory aids — like electronic reminders or sticky notes — to get through your day or for things you used to handle on your own. Another early sign of Alzheimer’s disease is forgetting recently learned information, asking for the same information repeatedly, or forgetting important dates. All of us sometimes make errors when balancing our bank accounts or doing a math problem. People with early Alzheimer’s often have trouble working with numbers or following a plan. This may show up as difficulties keeping track of monthly bills or following a recipe, for example. While sometimes forgetting what day it is is a normal lapse in memory, having trouble with the passage of time can be an early sign of Alzheimer’s. A person with Alzheimer’s may forget where they are or how they got there or lose track of dates or seasons. Alzheimer’s can change a person’s decision-making skills or judgment, which may appear as making poor decisions with money — giving in to scams, for example — or a decline in personal grooming. While Alzheimer’s disease is not a normal part of the aging process, it is possible for people with the disease to live a fulfilling life with proper care. Tracking concerning symptoms can help you or a loved one get needed care.